I am feeling much love for calligraphic, chaotic florals lately. The other day, Kurt and I were walking down 1st Ave, and I spotted a beautiful, printed, floral bag in a window which I had to stop and absorb. The flowers reminded me of the kind of batik-y roughly printed fabric you might see in an old beach house or summer cabin...washed out, linen-y, watercolor-y. Gorgeous earthy hues with imperfect edges...inky shapes meeting each other in beautiful, organic edges. I was struck by the same feeling when I saw the gorgeous, explorative textile/fashion work of Karen Nicol...whose slightly messy, totally feminine, beautifully personal fiber and embroidery pieces seem to hold a mysterious, dark interior monologue...they're whimisical, but a bit sensuous...serious, yet artistic and gestural. A perfect example of where my mind keeps wanting to wander off to. These are so stunning. Susy, you are a wonder. It's weird...I saw these and I thought...hey, that's something really new. Although I like the fun style of doodly stuff...these just seemed...I don't know...different-- I like that they are a little bit emotional...less cute. I'm really happy you guys like them...Melis, I'll try and get a pic of that bag-- been meaning to get down the street and document it for posterity. have sore throat today...so it might be tomorrow. xo! sigh...your pick. What if one *needed* to purchase? 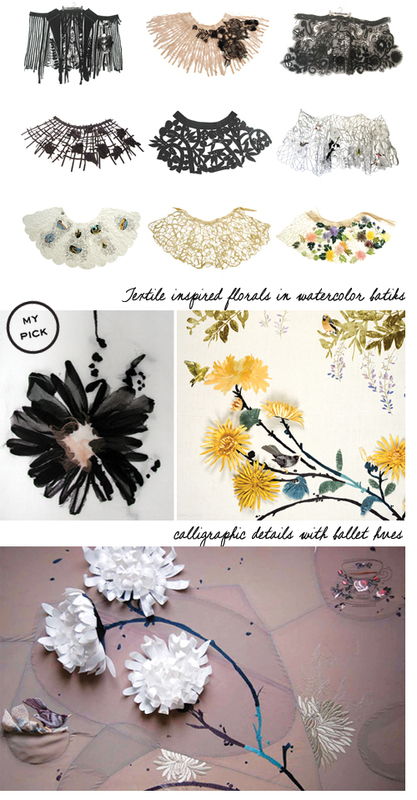 Love all the florals and the updated design...love your blog!